If you have no kids then please listen up to this valuable advice. If you want to buy a gift for someone's kid and you want to maintain a happy relationship with that person then never buy musical toys. Mr. 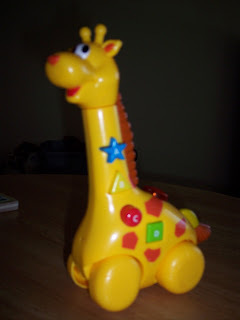 Giraffe might not make it through the day. Just wanted to share and help preserve long lasting friendships or family bonds. Lol. I have been guilty of this one. Hilarious and so true! No musical toys. I know the feeling. My oldest nephew had a Mr. Giraffe. He drug that dang thing everywhere with him. I hated it. Mr. Giraffe can't possibly be as bad as Chicken Limbo. A little girl I took care of had it and you could hear it from the basement...ugh. I bought it for my Uncle to keep for his grandkids the year I was mad at him. OMG my sister in law is queen for getting loud toys. And do you know when she gives it to us she looks at me and starts laughing then says, "Tasha, you're going to hate me for getting this" She has a 17 yr old, can she not remember? Why does she keep doing this to me? I smile but I am really not happy when she does this. I am afraid for this Christmas. OMG! My father in law bought a toy saxaphone. It is the noisiest dag on toy in the world.And my son loves it. I can't wait until he's older so I can throw it away. I totally understand what you're going through!